Jumpsport, an American company based in San Jose, California, has been changing the world of trampolines since 1997. In case you didn’t know, this is the manufacturer behind the invention of trampoline enclosure net- a widely recognized trampoline safety innovation that continues to add safety to every bounce. Jumpsport trampolines boast several other inventions that you won’t find in other brands but what we really love about this manufacturer is their belief that a trampoline should be a one-time purchase. And all you need is a glance at our Jumpsport Trampolines Reviews 2019 to understand what they mean by this. This Jumpsport 14’ trampoline might interest anyone looking for a large trampoline for the family. We can’t deny that it’s pricey, but it really pays for itself with the level of safety and bounce technology that it has been crafted with. One of the best jumpsport trampolines, this model gets its name from its dual-mat construction design. It has a secondary mat beneath the primary jumping mat with a separate set of springs. This mat works by trapping air that acts as an air pillow to absorb shock with every jump thereby offering the jumpers a more forgiving landing. The Jumpsport 14’ Doublebounce Alleyoop trampoline is fitted with 128 black, high-performance springs that again make it incredibly bouncy and an ideal option for gymnastics looking for the bounciest jumpsport trampoline. Its 250 weight limit means that it can accommodate several jumpers above 6 years at a go, and the lifetime warranty on the frame and posts is a hint of its quality. Speaking of warranty, you also get 10 years, 5 years, and 2 years for the net, springs, and spring pad respectively. The Powerbounce might interest you if you are looking for a relatively affordable Jumpsport trampoline with enclosure that doesn’t sacrifice on performance and safety. The major difference between this model and the Doublebounce above is that the Powerbounce uses only 1 jumping mat. Uniquely, this trampoline has a dual spring assembly with a total of 144 black high-performance springs that significantly boost bounce performance. Another interesting aspect of this dual spring configuration is that you can adjust the bounce. This versatility coupled with the general durability of this trampoline means that it literally grows with enthusiastic gymnastics as they improve their skills. With regard to safety, this trampoline features Jumpsport’s patented unforgettable overlapping doorway and the jumping mat is 35’’ high to prevent hitting the ground. 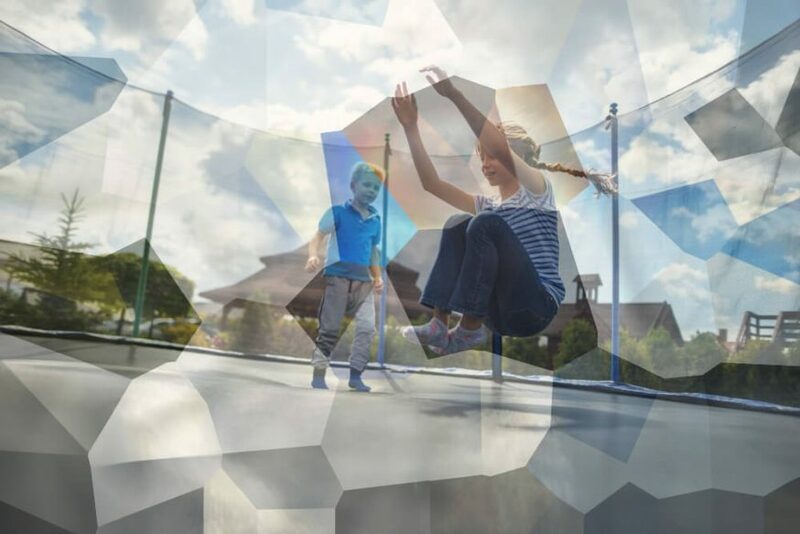 Rectangular trampolines are the leaders in terms of rebound and what we are looking at here is definitely one of the bounciest Jumpsport trampolines in 2019. This is a 10’ by 17’ model that is meant for families with upcoming enthusiastic jumpers. So, what does it offer? The AlleyOOP VariableBounce is fitted with 108 high-performance black springs that have been crafted from music wire with the main aim of sending the jumpers higher. This trampoline gets its name from the VariableBounce technology used for its spring system. Basically, this system consists of 2 sets of springs with alternating v-ring lengths that allow the jumper to absorb impacts from landings slowly before sending them up again. To complement this high bounce performance, this trampoline is fitted with a 7’ enclosure system and the jumping surface is high off the ground. This rectangular trampoline by Jumpsport also comes with the unbeatable warranty deal that this manufacturer is known for: frame and posts- lifetime, jumping mat and netting enclosure- 10 years, springs- 5 years, spring pad- 2 years, and 1 year for all other components. The Jumpsport Stagedbounce rectangular trampoline is pretty much similar to the variablebounce above in that they are both 10’ by 17’ and are fitted with 108 springs. In addition, the StagedBounce spring system technology of the StagedBounce trampoline works in a similar manner to the variablebounce technology by delaying the full engagement of some springs by a split second. The difference, however, is that the StagedBounce tramp uses longer springs with a greater stretch and, therefore, offers a much higher bounce. These springs again get a really good boost from the Permatron jumping mat that offers high-tensile strength credit to its 10 rows of stitching. Another thing that makes this the best Jumpsport trampoline for gymnastics is the unique double-truss heavy-duty frame that is made from cold-rolled steel for durability. The 7’ enclosure poles, on the other hand, make it quite hard for even the highest jumper to go over the net. Are you tired of cheap trampolines that you have to replace every other year but your budget won’t allow you to spend over 2k on a high-end model? Well, the JumpSport Elite 12’ might be what you need. This bouncer is relatively affordable compared to the VariableBounce and PowerBounce tramps that we’ve seen before, albeit notably pricier if you were to compare it with other standard brands such as Skywalker. But what we love most about this cheap JumpSport trampoline is that it is designed with the coveted StagedBounce technology. Thus, you can be assured that you are not losing out on bounce regardless of the low price tag. There’s yet another thing that sets the Elite apart from other JumpSport trampolines; it’s internally-mounted enclosure system. This means that the risk of the jumpers slamming on the steel frame or getting their feet and fingers trapped in the spring system is greatly reduced. In addition, the cost of this trampoline also gets you JumpSport’s Proflex Basketball package which includes a 5’’ inflatable basketball, a backboard, and a cushioned hoop. The Elite has a manufacturer weight limit of 240 pounds although some previous users report that they have had over 700 pounds on it safely (note that we’d not recommend it). JumpSport trampolines are known for 2 things; quality construction and a high price tag. That does not mean that this manufacturer doesn’t offer affordable options for homeowners operating at a tight budget though. The Skybounce 14’ XPS is one of the cheapest jumpsport trampolines in 2019 and a highly recommendable option if you are in need of a quality tramp at a low price. This 14 Jumpsport trampoline has 1.65’’ steel frame diameter and a woven enclosure net with safety straps. An interesting feature of this net is that it attaches inside the jumping mat to leave the spring system out. It also features 96 6.5’’ springs that offer above-average bounce thanks to the StagedBounce technology that has been used for the premium Permatron mat. In terms of safety, the spring system has thick padding and the net stretches inwards to keep the jumpers off the support poles. This trampoline comes with a 3-year warranty for the frame, spring, and mat, and 6 months for the pad. Jumpsport is known more for its rebounders than its standard trampolines, and the 350 Pro is our number one recommendation in our jumpsport rebounder reviews. This fitness trampoline has been tested to offer up to 1.2 million jumps and will make a great choice for commercial use with a small group, or even personal training. The 350 Pro has a total diameter of 39’’ and a total jumping surface diameter of 32.5’’. What most people love about this rebounder is that it uses bungee cords (36) as opposed to springs and this makes it amazingly quiet. This means that you can use it indoors even at night without waking others. On the same subject of bungee cords, it’s impressive that you can adjust the bounce tension depending on your weight and performance needs. We also like that this trampoline uses this manufacturer’s ‘best-arched legs’ thereby eliminating the risk of tipping completely. We appreciate that it is light at around 18 pounds and can, therefore, be moved easily. I believe this will mean a lot to you if you want something that you can use either indoor or outdoor. Our next pick here is one of the best mini trampolines for starters by Jumpsport and actually among the most sought after today. The Jumpsport 250 mini trampoline is a lot cheaper than the 350 Pro above and, therefore, a great model when money is tight. But what’s impressive about this model is that it is fitted with the same frame and legs that Jumpsport uses for its high-end fitness tramps. The major differences between the 250 and the 350 Pro is that the former uses 30 elastic cord as opposed to the 36 bungee cords that the 350 uses. This explains why the 250 is rated at 400K bounce cycles. In addition, the elastic cord system of the 250 isn’t adjustable, but this shouldn’t be an issue especially if you are buying the trampoline for personal use. This mini tramp has a total diameter of 39 inches and a bounce area of 485 sq. in. without the skirt. The petals measure 5.5’’ and add to the bounce area to offer you a total workout area of 1030 sq. in. which is practical for most trampoline enthusiasts within this trampoline’s 250-pound weight limit. The Jumpsport 570 Pro is currently the priciest mini trampoline in Jumpsport’s Pro series. This is a commercial-grade model that has been engineered to be the best mini trampoline for professionals. Every component of the 570 Pro has been crafted with quality and durability in mind. For instance, compared to the mini trampolines that we’ve seen so far, the 570 Pro is built on a wider frame with a diameter of 44 inches. This means that it offers a wider workout surface, 1334 sq. in. to be precise and a larger bounce area (729 sq. in). This larger bounce area coupled with the 36 easy-adjust cords opens doors to a whole range of workout exercises. The cords used here also make this rebounder amazingly durable and are intended to offer you up to 1.6 million bounce cycles. Our last contender in these best Jumpsport trampoline reviews is one of the best for beginners. This is a cheap mini trampoline designed to be a good fit for people who want to say fit and tone their body without spending so much on the rebounder. However, keep in mind that this manufacturer did cut several corners to make this model affordable. For instance, its 225-pound weight limit and single bungee cord firmness level mean that it is not for everyone. In addition, the 200 uses straight legs as opposed to arched legs and thereby means that it can tip over in case you go ballistic on it. All in all, the Jumpsport 200 fitness trampoline is still a great option if you are starting out on these fitness tools and aren’t ready to spend so much on it. Remember to check the weight limit though. As you might have realized in these Jumpsport fitness trampoline reviews, products from this brand are relatively pricey compared to other manufacturers’ such as Skywalker. While a higher price tag correlates with high quality in the world of trampolines, it’s always important to double check what you are really getting for your money. Feedback from previous customers is a great place to know how a trampoline performs when put to the test. Jumpsport is all about quality construction and in most instances, it offers a lifetime warranty for its trampolines’ frames and legs. Don’t assume though: double check what is covered and what is not and the conditions that might void the warranty. Safety is a key priority for virtually everyone when buying a fitness trampoline and it really pays to understand what measures the manufacturer has put in place to guarantee the jumpers’ safety. While Jumpsport trampolines are marketed as the safest in the world, they do come with a few misses that you really want to keep an eye on. For instance, most of its trampolines including the VariableBounce and DoubleBounce have an exterior netting enclosure assembly. And this means that the spring system is along the edges of the jumping mat and it’s a threat to the jumpers’ safety. That being said, consider the quality of the padding that the trampoline is fitted with. In regard to the mini trampolines, the most important safety aspects include the type of legs used for the rebounder (straight or arched) and the weight limit. There is no doubt that JumpSport is one of the best trampoline brands that one can consider today. What give these tramps their competitive edge are the high-quality, safety, and durability levels that they are engineered with coupled with the incredible warranty deals. We endeavored to include a tramp for everyone in these Jumpsport trampolines reviews. If you are searching for the perfect trampoline for a family of gymnastics, the DoubleBounce, VariableBounce, StagedBounce, and SkyBounce might interest you. On the other hand, if you are after a small fitness trampoline that you can use both indoors and outdoors, our last 4 options in this list got your back.